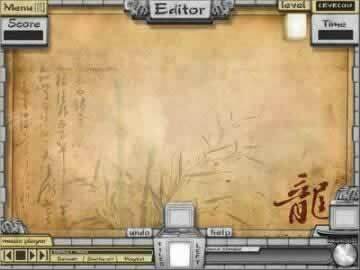 Ancient TriJong Game Review - Download and Play Free Version! Over 150 layouts to complete. Quest mode gives you something to work towards and keeps the game interesting. Great hybrid of both card games and mahjong. Game gets repetitive and there is very little to no variation between levels and game modes. Cannot download layouts on the internet like other games in the genre. Normal mahjong game is unavailable. Ancient TriPeaks has you matching playing card-suited mahjong tiles 1 value higher or lower than the source pile. So if you have an ""8"" in the source pile, click on any ""7"" or ""9"" on the board. Keep making matches until you run out of options and need to draw a new source tile. The first few levels of Ancient TriPeaks will seem fairly easy. However, the board setup will get harder, you will get less source tiles to use, and you will have to be clever to clear the board. Which tile you click on, how many tiles you uncover with every match, how you use the Wild Cards and how you string together runs will all determine your success. Soon you will start to learn that it really does matter which tile you click on! Play Ancient TriJong for any length of time and it is really easy to get hooked! Trust me, I had a hard time even putting this game up because I was quickly getting hooked on playing it! If you like solitaire card games or mahjong, give the free trial download of Ancient Tripeaks a try. I don't think you will regret it! For those of you who love fast-paced games that are easy to learn and hard to master, this game is for you. 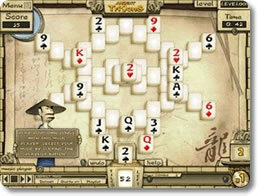 Ancient TriJong is a crossover game that incorporates elements from both mahjong and solitaire-like card games. In this game you compete against the clock to rid the board of tiles and score the highest score you can. Successfully pairing every tile advances you to the next round, while coming up short requires you to start over. Ancient TriJong is a spin off of the classic Chinese tile matching game mahjong. In this game rather than match like tiles, you pair tiles that are on higher or lower. There is a tile at the bottom of the screen that is your “working” tile and you pair it with numbers higher or lower. In the game the tiles are cards in a card deck so if you have a two as your working tile, you can pair it with either a three or an Ace of any suit. This makes the game similar to solitaire or the card game “speed,” which has you completing the same objectives, with cards rather than tiles. This game is very quick and easy to first pick up. It gets difficult as you play so strategy is crucial. It is important to compose yourself and plan out your moves in advance. If you see that your board is heavy with nines and tens, make sure you incorporate those in your sequence as well as you can. Making combos (series of pairs without having to go to the next “working” tile) earns you bonus points and builds your multiplier. Having the multiplier high is crucial for earning serious points and advancing in the game. There are three modes in this game, with two being different modes of play. 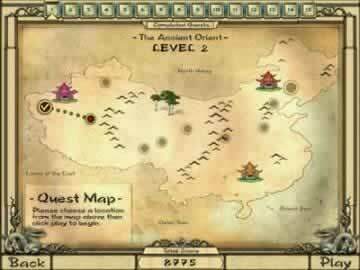 The first is the storyline quest mode that has you traveling through China, completing levels along the way. In this you advance from one destination to the next completing puzzles of increasing difficulty. There are 15 stages with about 10 levels per stage, so the quest will keep you busy for quite some time. The second mode is a survival mode that has you play until you fail at a puzzle. In this your score is summed over all the levels you successfully complete and once you fail, your total score is added to the high scores list. This is for players with less time at their disposal, and is great for comparing your abilities to your friends and family. The final of modes, which is not based on playing, is a Create Your Own Layout mode. In this you build a layout that you want to try to solve. Having this ability to build what you please gives the game a creative element that might go a long way for some. Also, building your own layouts opens up endless possibilities for games. There are literally an infinite amount of levels you could play because of this option. There are only a few negatives in this game, which are typical of many games in the mahjong category. The first and most prominent is monotony. You might get bored playing this game, despite the number of levels. Certainly not having to play the same layout is a plus, however, the object of every game is the same. Many mahjong games tend to get boring and this game is no exception. It's good for playing in spurts, however, over time it might get old. Another flaw of this game is having only one option of play. Not being able to play traditional mahjong along with the trijong takes away from the game. This game is more niche and exclusive because it doesn't have a traditional style of play. Overall, Ancient Trijong is a good mahjong game that brings an interesting twist to the classic Chinese favorite tile matching game. The incorporation of solitaire into the mahjong play is exciting, however, not having more game styles or the traditional mahjong game takes away from its quality. This game is great for anyone because it is easy to begin and figure out, however, strategy is a big part of the game and it will need to be picked up as you progress. This is a fun game that will provide hours and hours of mahjong-like game play and is worth the download.